Khalil, S. A. and Einas, El-Shamy. assay as detection of Adhesin-encoding genes of E.coli by using multiplex PCR and detection of Staphylococcus aureus super antigen genes by using multiplex PCR. This study was carried-out on random samples (150 samples) of yolk sac that were collected from different private chick hatcheries from newly hatched chicks. The samples were collected, labeled and transported in ice box to the laboratory of Department of Microbiology, Faculty of Veterinary Medicine, Alexandria University bacteriological identification was carried-out for the bacterial isolates of these samples. It could be concluded that, the main bacterial agents causing omphalitis include Staphylococcus aureus, E. coli, Proteus vulgaris, Proteus mirabilis, klebsiella pneumonia and Enterobacterhafniae. Khalil, S. A. and Einas, El-Shamy. Aerobic Bacteria Associated with Omphalitis of Chicks. AJVS. 2012; 37(1): 69-77. Khalil, S. A. and Einas, El-Shamy. Aerobic Bacteria Associated with Omphalitis of Chicks. http://www.alexjvs.com/?mno=37919 [Access: April 18, 2019]. Khalil, S. A. and Einas, El-Shamy. Aerobic Bacteria Associated with Omphalitis of Chicks. AJVS. (2012), [cited April 18, 2019]; 37(1): 69-77. Khalil, S. A. and Einas, El-Shamy (2012) Aerobic Bacteria Associated with Omphalitis of Chicks. AJVS, 37 (1), 69-77. Khalil, S. A. and Einas, El-Shamy. 2012. Aerobic Bacteria Associated with Omphalitis of Chicks. Alexandria Journal of Veterinary Sciences, 37 (1), 69-77. Khalil, S. A. and Einas, El-Shamy. "Aerobic Bacteria Associated with Omphalitis of Chicks." Alexandria Journal of Veterinary Sciences 37 (2012), 69-77. Khalil, S. A. and Einas, El-Shamy. "Aerobic Bacteria Associated with Omphalitis of Chicks." 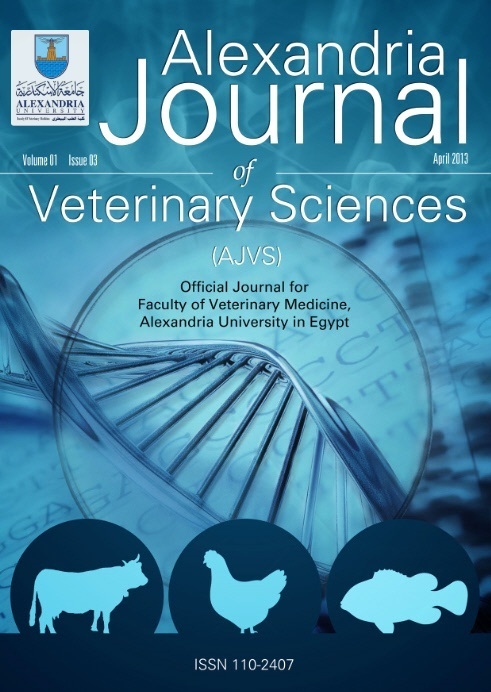 Alexandria Journal of Veterinary Sciences 37.1 (2012), 69-77. Print. Khalil, S. A. and Einas, El-Shamy (2012) Aerobic Bacteria Associated with Omphalitis of Chicks. Alexandria Journal of Veterinary Sciences, 37 (1), 69-77.